In the Amazing Gaming platform our team at Betting Promotion manage everything Sportsbook related, from Event Creation to Settlements and everything in between including Risk Management. This solution is aimed at Operators looking to get started with their business. We offer full support during the integration phase. The Amazing Gaming platform presents unrivalled value compared to other providers. If an operator is looking to replace their existing provider/s this platform is a great option delivering everything you need. Excellent quality and very cost-effective. The platform is easy to integrate, operator receives full support through every step of the process. No setup fees. We require a deposit which is refunded when operator goes live. More info about complete platform on www.AmazingGaming.com. Cash Out is a revolutionary feature giving the player control over their bets. No need to wait until at bet is decided. With Cash Out the customer is offered the opportunity to get a return on their bet before the event has finished – either lock in a profit or cut the losses during a match. Our model will calculate the live market numbers in real-time and give players the value of their bet and they can choose when to Cash Out. This feature gives more power to the customer. As an operator Cash Out is attractive as the bets that are cashed out are being paid at a discount compared to the current price of the bets. This reduce the cost of winning bets. Fast Bets are minute-to-minute markets in Live betting. Time frames of 1-10 minutes betting on specific incidents to take place. Instant gratification element similar to Casino games but for Sportsbook. Engaging customers while driving volume and revenue. Customers place bets on whether incidents will take place within a defined period during a Live sports event. This type of feature is ideal for those players who prefer a quick paced model and become bored with waiting for the match to end to see their bet settled. Markets for football matches include whether there will be a goal, corner, free-kick- goal-kick, red card or throw-in during the period. Multiple Generator is a feature making it easier for customers to place multiples. Placing multiples to high odds is a habit mostly carried out by recreational customers that are more susceptible to bet blindly for the sake of entertainment and action. The same type of customers using the casino. When using Multiple Generator, the customer enters how much they would like to Win and size of Stake. The engine then generates a bet containing multiple events. Normally the customer would have to spend time creating a bet slip containing multiple events. Using the Multiple Generator, the customer is able to place a multiple in just a few seconds. The aim of the Multiple Generator is to engage users and encourage bets placed to high margins in order to drive revenue. Cross sales opportunity between Sportsbook and Casino. In the frontend facing the customer there is an option to display the Global Bet Ticker. In this space a customer can see all incoming bets that placed by other players. From here the customer can see what Match, Market, Odds, Stake and potential Win on each bets placed in real time with the possibility of copying bets to their own betslip. Real time animation for Live betting emulating what is happening in live matches. Live widget includes real time Animations, Lineups, Pre-live statistics, Live Statistics and updates. The Amazing Gaming platform offer the full suite of Sportsbook, Live Dealer, Slot Games, Table Games and RNG Games. Everything you need in one solution presenting the best value possible for a complete package. Betting Promotion power the Sportsbook featured on the Amazing Gaming platform. Betting Promotion have successfully traded on major market places globally since 2003, using our own funds. Odds in Sportsbook solution are derived from this trading using our algorithm based high-frequency engine adjusting prices within a faction of a second on any market move. Many Sportsbook solutions use market averages from a broad sample of sources or rely on copying a specific source. That type of solution would get beat in the fast-paced high-volume market places we trade on. If our odds are off, we lose money. With our algorithms and ability to respond to market changes quickly we manage to stay profitable in the toughest environments in Sports Betting. The odds in our Sportsbook solution are derived from the trading engine ensuring profitability for our operators! Large coverage in Pre-live with 35,000+ events per month and in Live 25,000+. Complete with settlements, statistics and data. 2000+ different markets offered across all sports. For example, 160+ markets on Premier League football. 55+ different sports Pre-live and 20+ different sports Live. Our offering is ever expanding, we are constantly looking to implement new sports and markets. Betting Promotion started covering esports as early as 2014. To date we cover 20+ different esports and up to 30+ markets. The team at Betting Promotion and our dedicated accounts managers are there to support our operators 24/7. In backend all messages are sent through a two-way REST API that accept and respond with JSON message format. For complete technical information regarding integration, setup and structure please contact sales and we will provide you with all relevant information regarding the Fully Managed Sportsbook. Let us know if you are interested in getting a test account, we are more than happy to set this up for you. 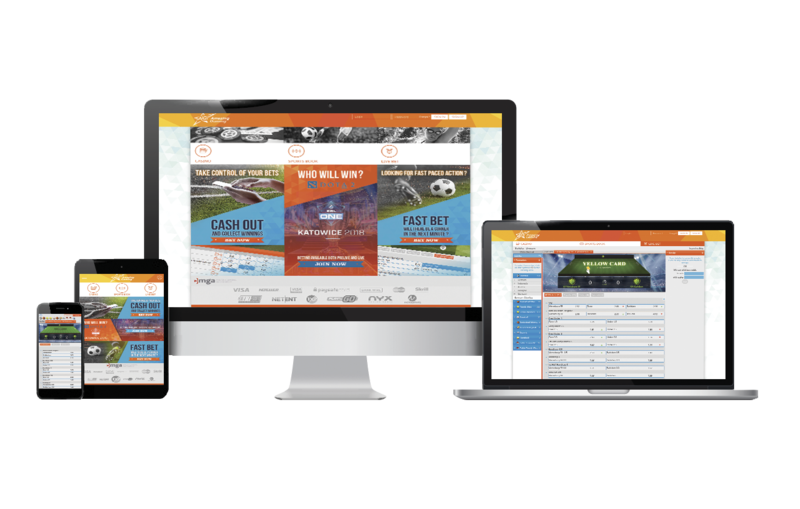 With our Fully Managed Sportsbook solution we can cater to all your needs – whether you are running a retail betting shop, online or across multiple platforms. We provide you with all the tools you need. The Sportsbook solution is a great way to attract new players and improve wager values through an unmatched choice of Pre-live and live events. Betting Promotion trade for hundreds of million Euros every year in the most competitive market places in the world – using our own funds. We have been doing so since 2003. Our algorithm based high-frequency trading engine adjust our prices within fraction of a second on any price move. This pricing information is what we provide in our Fully Managed Sportsbook. No other feed will be able to deliver the same odds quality! Our flexible Sportsbook solution is open-ended and with a variety of interface options. Fully compatible with Apple iOS, Android and all leading mobile devices and browsers. Frontend components are available through API for full customization. Backend accessible through ease of use dashboard. What does the Sportsbook solution include? Part of the Amazing Gaming platform including Sportsbook, Live Dealer, Slot Games, Table Games and RNG Games. Betting Promotion have provided esports since 2014 and put a large focus in this area considering the demand and huge potential in revenue stream.